Recruitment sessions will be held at HISD high schools Jan. 21-Feb. 8, 2019. Competitive applicants are usually economically disadvantaged and generally the first in their family to graduate from a four-year college or university. Students must have a strong academic profile that includes getting good grades in rigorous courses. EMERGE is looking for students with drive, perseverance, curiosity, humility, and gratitude. 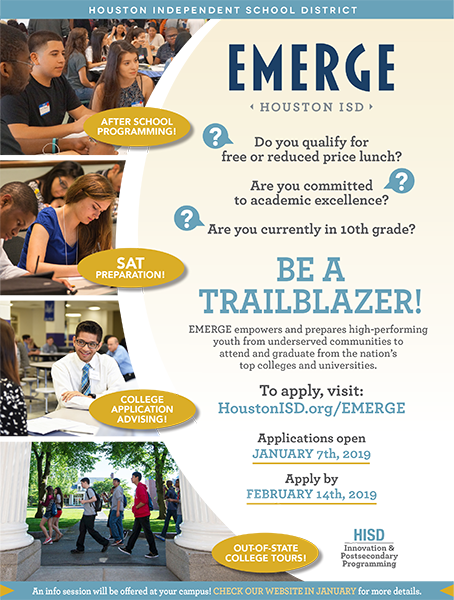 If you have any questions about the application, please contact student recruiter Selena Martinez at Selena.Martinez@houstonisd.org.